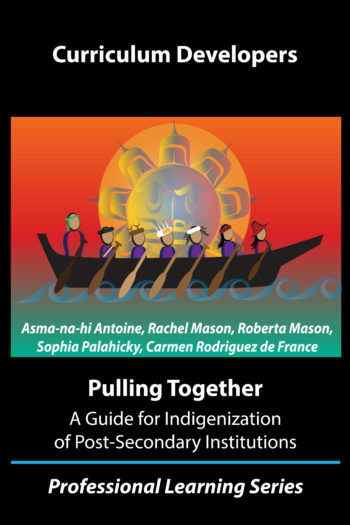 Subtitle: Pulling Together: A guide for Indigenization of post-secondary institutions. A professional learning series. The Curriculum Developers Guide is part of an open professional learning series developed for staff across post-secondary institutions in British Columbia. This guide’s sections are intended, when taken all together, to help in the process of integrating, honouring, and respecting Indigenous culture, history, and knowledge in curriculum Each section holds a series of self-exploratory and group professional development activities. We encourage you to use what you need and adapt to share with colleagues. Pulling Together: A Guide for Curriculum Developers by Asma-na-hi Antoine, Rachel Mason, Roberta Mason, Sophia Palahicky, and Carmen Rodriguez de France is licensed under a Creative Commons Attribution-NonCommercial 4.0 International License, except where otherwise noted. Inspired by the annual gathering of ocean-going canoes through Tribal Journeys, ‘Pulling Together’ created by Kwakwaka’wakw artist, Lou-ann Neel, is intended to represent the connections each of us has to our respective Nations and to one another as we Pull Together. Working toward our common visions, we move forward in sync, so we can continue to build and manifest strong, healthy communities with foundations rooted in our ancient ways. Thank you to the Indigenization Project Steering Committee, project advisors and BCcampus staff who offered their precious time and energy to guide this project. Your expertise, gifts, and generosity were deeply appreciated.